Plus Special Guests Ministry, Suicidal Tendencies, Atreyu, Vamps & Dozens More! Glenn Danzig's comic book company Verotik will be hosting a few special signings at their booth during the festival. To commemorate the release date of his new album, Black Laden Crown, Danzig has confirmed a rare and exclusive autograph signing session for the first day of the festival only, on Friday, May 26th. Additionally, award-winning comic book artist Simon Bisley will be signing on both nights of the festival, Friday, May 26th and Saturday, May 27th. 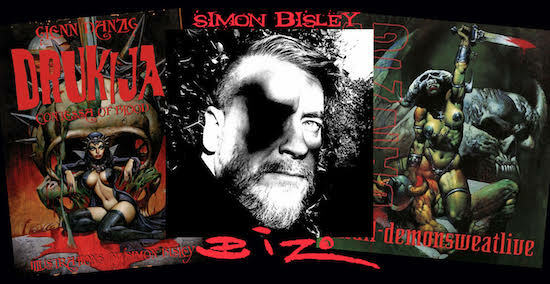 Bisley has contributed to a number of comics including Verotik, DC, Fleetway, Full Circle, Marvel, and more, as well as Danzig album covers, including Lost Tracks Of Danzig, 6:66 Satan's Child, and Thrall: Demonsweatlive. His work has also influenced Beast in the 2006 Doctor Who episode "The Satan Pit," and Simon Pegg's character Tim Bisley on the U.K.'s Channel 4 sitcom, Spaced. 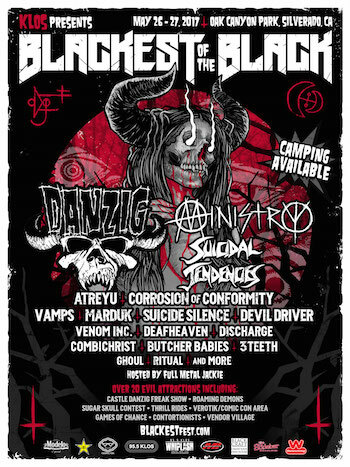 Suicidal Tendencies, Corrosion of Conformity, Suicide Silence, Discharge, Deafheaven, Butcher Babies, 3 Teeth, and more to be announced! Danzig, Ministry, Vamps, Atreyu, Venom Inc., DevilDriver, Marduk, Combichrist, Ghoul, Ritual, and more to be announced! This Thursday, May 11 from 8:00 a.m.-11:59 p.m. PT, KLOS-FM will offer a weekend general admission ticket 2-pack for $99.50, plus parking and fees at https://blackestfest.frontgatetickets.com. Blackest Of The Black is produced by Synergy Global Entertainment (SGE), and presented by KLOS 95.5 FM. Sponsors for Blackest Of The Black include Modelo, Rockstar Energy Drink, Cosmic Fog, Musicians Institute, Blackcraft Whiskey, and SlideBar, with more to be announced. KLOS The Rock of Southern California (95.5 FM) is a commercial Rock music formatted radio station in Southern California broadcasting to Los Angeles, Ventura, Riverside, San Bernardino, and Orange Counties. KLOS features specialty music shows such as Full Metal Jackie's Whiplash — Frosty, Heidi & Frank — Jonesy's Jukebox — Check I … 2, and many more. Owned by Cumulus Media, KLOS studios are in Culver City, CA and the station reaches an audience of over 2 million listeners each week.